Heliskiing & Cat Skiing near Red Mountain, B.C. Heli skiing with Snowwater Heli Skiing and Cat Skiing with Valhalla Powdercats near Red Mountain is your destination for unbelievable snow. Ski or ride light, deep powder that's distributed over 150,000 acres of pristine wilderness. Plus, you won't be racing for first lift in the morning. You're guaranteed at least 6 runs a day, safety gear and lesson, professional guides, accommodation, gourmet dining, snacks, and transport to and from the lodge. Snowcat backup for heliskiers: if bad weather prohibits flying, you'll still be taken skiing or riding via luxury snowcat. 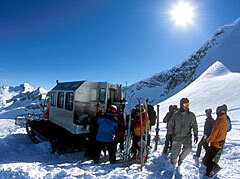 A helicopter can carry up to 3 people at a time, while a snowcat can carry up to 12 passengers plus 2 guides at a time. Can't decide between heliskiing or cat skiing? Check out the Kootenay Sampler Package, which combines both activities. You must be a strong intermediate to expert skier or snowboarder for cat skiing. 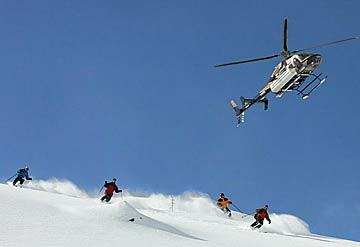 Heli skiing terrain is more demanding and should only be ventured only by advanced or expert skiers and riders. You need to be in great shape and able to withstand back country conditions, which aren't as predictable as groomed runs. The high altitude is also less forgiving on your body and breathing capacity, so be prepared to use a lot of energy every day you're shredding the pow. *Quote your discount code for Snowwater Heli Skiing or Valhalla Powdercats when making your booking with them. **The driving time is about 1 hour away from Rossland, BC. Need Red Mountain Accommodation? Try a Search Now! If you have not yet booked your Red Mountain lodging, start your research by visiting our Red Mountain vacation rental listings. You'll view the exact property you will stay in before you book it online (as opposed to an "example" of what you might get)! Customer support - if you want to talk to someone or need help, don't hesitate to contact us.